How should you choose your stateroom number? When booking your cruise, as well as choosing your ship, itinerary and date, you’ll often have the option to choose a particular stateroom, should you so wish. Choosing the stateroom category (inside, outside, balcony or suite) should be fairly straightforward. But what about the actual stateroom number? Is room 10567 better than 11259? Getting it wrong can potentially ruin your holiday, with noisy locations ruining your sleep or rocky locations causing seasickness. You’ll also want to avoid any awkward-shaped staterooms, ones with unusual balconies, or ones where people can see right in from the deck. Option 1. Do loads of research online about which stateroom numbers are best, pick one and see if it’s still available. Option 2. Ask your cruise concierge to choose the best available stateroom for you. Option 3. Let the cruise line choose the stateroom for you – this is known as a ‘Guaranteed Stateroom’. If you have lots of time and enjoy planning your own holidays down to the finest detail, then you may enjoy choosing your own stateroom. You can look up deck plans for each ship on Cruise118.com. If you search for particular stateroom numbers on the internet, you may sometimes be able to find reviews from people who’ve stayed there. Then when you book your cruise, you can ask if that particular stateroom is available, although of course there’s no guarantee that it will be. A much easier way to ensure a good stateroom is to let a cruise concierge pick it for you. Here at Cruise118, our cruise concierge team are highly trained and have all the information to hand about the accommodation on each ship. We can see which staterooms are still available, and help you to choose the best one. If certain aspects are important to you, such as location, size or facilities, be sure to mention it when you book and we’ll make sure your stateroom suits you perfectly. We’ll assign you a stateroom number, so you can double check that it’s right for you, should you so wish. Just give us a call on 0808 1234 118 to speak to one of the team. When you speak to your cruise concierge during your booking, they may give you the option of reserving a ‘guaranteed’ stateroom. If you book a guaranteed stateroom, your cabin number won’t be available at the time of booking. It will be allocated by the cruise line a few weeks prior to departure. You choose to be guaranteed an inside, outside, balcony or suite within a certain grade, but it could be anywhere on the ship. 1. 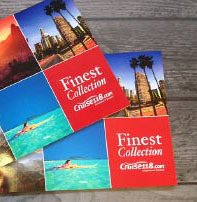 The cruise lines often offer a discount for guaranteed staterooms. So if you want the cheapest price possible, choosing a guaranteed stateroom is the way to get this. 2. There’s a chance of a free upgrade! If all the cheapest inside staterooms sell out, the cruise line won’t want to have to advertise a more expensive ‘From’ price. So they’ll make some insides available by upgrading some of the inside passengers to outside. And in turn, upgrading some of the outside passengers to balconies. Anyone with an allocated stateroom number won’t be moved, but if you’ve chosen a guaranteed stateroom, you’re in with a chance. 1. The chance of an upgrade with a guarantee stateroom is just that – a chance. If you don’t get the upgrade you could end up disappointed. 2. If you opt for a guaranteed stateroom you take the risk that it’s one of the ones that nobody would pick, given the choice. It might be noisy, far from the lift or an awkward shape – and you won’t know until it’s too late. Choosing the right stateroom is just one of the many choices that are yours to make when booking your cruise. If you’d like to leave it to the experts to make sure you get the best stateroom your money can buy, or you’d like to see if any guaranteed staterooms are available, our dedicated cruise concierge team are on hand to help. Just call 0207 980 2847 when you’re ready to book.